The Kalamazoo Concert Brass is a break out ensemble from and representing the Kalamazoo Concert Band. Join them for your favorite holiday tunes. This event requires FREE tickets. 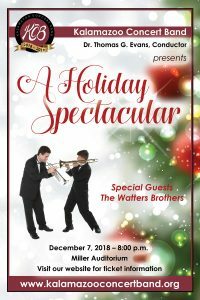 Introducing our 2018 Holiday Spectacular, featuring special guests Harry and Ken, The Watters Brothers and the WMU jazz faculty rhythm section. The concert will feature the band and the Watters Brothers playing seasonal classics you all know by heart but with a New Orleans jazz flair.